Lyndon began as a community of majestic old frame homes, set back on tree-shaded streets. Settlement began along the Louisville and Frankfort Railroad tracks (what is now Vinecrest). Rail was the only means of transportation at that time. Many of the original homes burned down as fires were dealt with from wells or cisterns. Alvin Wood gave the name of Lyndon to the area. He purchased 200 acres in 1865. Wood is credited with creating one of the first subdivisions in Kentucky. While platting the area, he dedicated a lot for a school. This lot became the Progress School. The building is still standing at the corner of Wood Rd. and Whipps Mill. The home is registered with the Kentucky Historical Society. Wood lived in a large brick home (this site). That home burned but there is a stone building (carriage house) built from the stone foundation which is still standing. At that time people had to go to St. Matthews to catch a train as there was no stop at Lyndon. The railroad told Alvin if he would furnish the land and build a station, they would begin service. That is when Wood named his station Lyndon. Lyndon became a stopping point in 1871. The first post office was set up in the depot, also in 1871. Longtime residents remember the “Potato Era,” when everywhere you looked there were fields of potatoes. They were grown and then hauled by the railroad to various places along the line. First grocery store: corner of Vinecrest and Lyndon Ln. Electric Interurbans began shortly after 1900. Lyndon began to grow. Interurban ran all the way to LaGrange. The Lyndon stop was located on the south side of LaGrange (across from Lyndon Lanes). Students rode the interurban to Anchorage as there was no high school in the area. The interurban was discontinued in 1934 as the automobile became the favorite mode of travel. The first school in Lyndon was Progress School (as noted above). This one-room school was started about 1880 and taught all 8 grades. Progress was known as a hard school with strict teachers, two of whom were descendants of Johann Sebastian Bach. Mary Alice Bromley was the last principal of the Progress School and the first principal of the new Lyndon Consolidated School when it was opened in 1938. Lyndon Volunteer Fire Department was organized in 1950. The first fire truck was kept in front of Lyndon Key Market by day and in John McCarthy’s Garage on Lyndon Ln. at night. The fire station was built by volunteers of the community. It opened in 1952. Fundraisers were held to support the purchase of more equipment and pay for operation of the Department. Kentucky Military Institute claims to hold the title of “oldest private military school in America.” It was founded in 1845 by General T. C. Allen. In 1896, Col. C. W. Fowler moved the school from Farmdale, Ky. to the location on LaGrange Rd. which is now occupied by The Brook. In 1875 the Kentucky Children’s Home began operation, also on LaGrange Rd. Its purpose was to receive homeless and destitute children for placement in foster homes. Private contributions supported the society at first and most of the work was carried out by civic-minded individuals. As the number of children increased, the state legislature began appropriating funds. The present site was purchased in April of 1922 and the campus was dedicated. Population of the home at that time was running well over 200 children. By 1940 the Commonwealth of Kentucky assumed full responsibility for the financial affairs. In 1960, KCH was moved under the department of Child Welfare Departments. 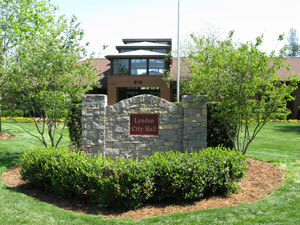 In the late 1930’s Lyndon Recreation was organized at Lyndon School. The program was financed with monies received from fish fries, carnivals and donations of interested parents and teachers. In 1945 Jefferson County Parks Board became associated with Lyndon Recreation. And in 1969 (when the Whipps Mill park was built), the program moved to that site. Alvin Wood was the youngest son of Dr. Peter Wood and Ann Long. He was born November 22, 1831, most probably in Middletown. By the age of 17, Alvin had started his working career as a clerk in downtown Louisville, living with his father at an address on Preston between Market and Jefferson. How Alvin, who lived downtown, met Mary Ellen Rudy of the eastern part of the county is a bit of a mystery. Mary Ellen was the eldest daughter of George Rudy, Jr. and Susan Frances Herr. They were married November 21, 1855. This marriage did give him connections to the Rudy and Herr families who were well-established. In the 1856 City tax records, Alvin is in the Eastern District of the City and has one slave valued at $500. By 1858, he owns his lot and has made improvements of $700 and owns 3 slaves, valued at $800. Shortly after this time, it appears he freed his slaves, which had been inherited through his marriage. By 1861, Alvin’s business had moved and his listing is “Wood, Alvin (Owen & Wood) 243 W. Market, home 848 Second, and Owen & Wood are listed under Boots & Shoes Retail. He continued in this partnership until 1867. In 1859 and 1861, Wood was one of two City Councilmen for the 4th Ward. The Tax List of 1865 lists him with 100 acres of land valued at $3500 (200 W. College east of Breckinridge), the value of his town lots $2,500, his carriage $300, clocks $50 for a total of $6,350. He is listed as a member of the militia. This put him at odds with most of his in-laws as they were supporters of the Confederate Army. Wisely waiting until after the end of the Civil War, Alvin moved to the country. In 1868 he resided in the country, but was still working in the shoe industry. This move would have been to what is now Lyndon. Alvin purchased some 300 acres with house from a Mrs. Tyler in the vicinity of the Sinking Fork of Beargrass Creek. History shows Wood lived briefly (possibly 2 years) in the home you are seeing today. Along the railroad tracks on his own land, Alvin Wood built a depot in 1871 so he and his neighbors wouldn’t have to go to St. Matthews to catch a train. Wood called his depot Lyndon, apparently after Lynn’s Station, a fort built in the 18th century on a nearby fork of Beargrass Creek. Trains began making Lyndon a regular stop and the station also became the post office, with Wood in charge as postmaster. Several of the Wood descendants still reside in the area, one on Wood Rd. The street bears the family name because the road was built on land once owned by Wood. He bought 200 acres in the area in 1865. Wood had a brick home, built by his slaves near Wood Road which was destroyed by fire in 1952. The land at one time included slave quarters. More than 20 years after the railroad station was built, Wood’s son George built a station for the Interurban commuter train that ran to LaGrange near Lyndon Lane and LaGrange Road. Residents got prescriptions and milk delivered by the electric train, and children rode it to school. Alvin Wood died February 7, 1891 in Louisville and is buried in Cave Hill Cemetery with his wife and children in the Wood family plot. The Courier-Journal-- Copyright 2004 The Courier-Journal. Along the railroad tracks on his own land, Alvin Wood built a depot in 1871 so he and his neighbors wouldn't have to go to St. Matthews to catch a train. Wood called his depot Lyndon, apparently after Lynn's Station, a fort built in the 18th century on a nearby fork of Beargrass Creek. Trains began making Lyndon a regular stop and the station also became the post office, with Wood in charge as postmaster. Nearly 120 years later, its founder's train stop near Vinecrest Avenue is gone, but Lyndon is booming. The fourth-class city -- incorporated in 1965 to avoid annexation by St. Matthews -- is roughly bounded by the Watterson Expressway on the west, Westport Road on the north, Whipps Mill Road on the east and Shelbyville Road on the south. It contains subdivisions, apartment complexes, shopping districts, traffic congestion -- but little evidence that Lyndon began as a train stop surrounded by woods and fields sprouting potatoes. By the early 1900s, with the interurban electric train making regular stops in Lyndon on its route linking Louisville with La Grange, the town grew into a commuter community and residents settled in bungalows in the woods. Today, not far from a maze of apartment complexes and subdivisions, some fine Lyndon heirlooms are hiding on shady roads and at the end of long, tree-lined drives. Each tells a part of Lyndon's history. Virginia Wood Hodge, the great-granddaughter of Alvin Wood, lives on Wood Road in the farmhouse where she was born in 1920. The street bears the family name, she said, because the road was built on land once owned by her great-grandfather. He bought 200 acres in the area in 1865, she said, and built the train station there. Wood's brick home, built by his slaves near Wood Road, was destroyed by fire in 1952. Hodge said the land at one time included slave quarters. More than 20 years after the railroad station was built, Wood's son, George Wood, built a station for the Interurban commuter train that ran to La Grange near Lyndon Lane and La Grange Road, Hodge said. Residents got prescriptions and milk delivered by the electric train, and children rode it to school. Decades before the interurban train came through, members of the Ormsby family, wealthy early settlers, had built two elegant mansions on Lyndon's outskirts. One of the homes, hidden at the end of a long drive off La Grange Road, was the centerpiece in the mid-1800s of Col. Stephen Ormsby's estate. Ormsby gained fame as a colonel in the Louisville Legion, which fought in the Mexican War in 1846. His father, Judge Stephen Ormsby, came to Louisville about 1791, when he was appointed judge of Jefferson District Court. He was also a Jefferson circuit judge and a member of the U.S. Congress before he became president of the Bank of Louisville. The judge bought about 1,000 acres along Goose Creek in 1803, and a year later his only son was born there, according to records of the Jefferson County Department of Historic Preservation and Archives. According to oral tradition, Judge Ormsby heard an old superstition that a man over 50 who builds a new home would never live to enjoy it, so he deeded the 800-acre estate in 1830 to his son and charged him with building the house. The son and his wife, Martha Sherley, had 11 children, all born at the estate -- called Maghera Glass, a gaelic phrase meaning "green grass." The judge died there in 1844, as did his son 25 years later. In 1896, the house and part of the estate were sold to the Kentucky Military Institute, which built numerous other buildings on the property and had both a preparatory school and a college division there at one time. The school was attended by five Union and two Confederate generals, including John Morgan, and quit holding classes during the Civil War because its cadets and most of its faculty were on the battlefields. The school closed in 1973 and the old mansion and grounds are now Ten Broeck Hospital, which specializes in drug and alcohol treatment. East of that site, just outside Lyndon's boundaries at the southeast corner of Whipps Mill and La Grange roads, one of Judge Ormsby's grandsons built a stately mansion with an elaborate iron porch and balcony. The home sits on a small hill, which is why Hamilton Ormsby may have called it Bellevoir, "beautiful view." In the late 1800s, the estate was known for its dairy cattle and trotting horses. It even had its own railroad terminal, Ormsby Station. Ormsby descendants sold the property in 1912 for use as a children's home. The county closed the Ormsby Village complex for needy and troubled juveniles in 1979 but restored the mansion two years ago. The county is now developing the estate -- with the mansion as its centerpiece -- into a commercial office park called Hurstbourne Green. South of Bellevoir on Whipps Mill Road in Lyndon, Grace Perry, the descendant of German settlers, lives at Mill Stream, a 100-year-old estate built by her late father, E. L. Rothenburger. Rothenburger grew up on nearby Oxmoor Farm, where his parents worked. Perry said German immigrants in the late 1800s rented parcels of the farm, owned by the Bullitt family, to grow potatoes. Some of them later bought land for farming. Decorating Perry's yard is a millstone from the old Whipps Mill, which operated along the Sinking Fork of Beargrass Creek more than 175 years ago. Her father found the stone in the creek while he was fishing, she said. Near the heart of Lyndon, Progress School, a one-room, wood-frame building at Whipps Mill and Wood roads, opened in 1891 for grades one through eight. Sisters Linnie and Lizzie Bach, piano-playing descendants of composer Johann Sebastian Bach, taught there as a team from 1912 to 1918, according to "Lyndon Lore," a history of the area published in 1972 by The Lyndon Homemaker's Club. Mary Emily Hawkins, of La Grange Road, was a pupil there from 1919 to 1925, when the school had two rooms and a pot-bellied stove. But it lacked running water and children had to carry their own water from home, she said. Hawkins carried hers in an "elegant" perfume bottle. The school, which closed in 1936, was remodeled and is now a private residence. Before the turn of the century, with the train stop linking Lyndon to Louisville, George R. Washburn tried to develop his 50 acres near the tracks into Warwick Villa -- "the beautiful little suburb on the high tide of prosperity." But the panic of 1893 caused financial problems and few houses were built. Washburn sold the original lots just west of Lyndon in 1928 to Henry Holzheimer Sr., who successfully developed a Warwick Villa subdivision in St. Matthews. The property had been in the Washburn family since 1815, according to county historic records. The two-story framed Washburn House, built in the 1830s, is still on Fountain Avenue, surrounded by newer homes. Although the original subdivision failed, Louisville residents around the turn of the century were riding the train to the Warwick Villa Hotel, which fronted the railroad tracks near Washburn Avenue. The hotel had "social prominence" as a summer gathering spot because of the "fresh country air and delicious meals for which the hotel was famous," according to "Lyndon Lore." The hotel, however, was destroyed by fire and was not rebuilt. Hotel visitors probably drank from the nearby Indian Mineral Wells, which operated into the 1940s. The Interurban Co. also attempted to draw Louisville residents to Lyndon. The train company owned and promoted a park on the south side of La Grange Road near Benjamin Road. But, according to "Lyndon Lore," attempts to boost ridership by luring people there to "enjoy a day in the woods and fresh air" were not successful and the park was sold. The interurban train discontinued service in 1934. Its path was later covered when La Grange Road was widened from two to four lanes. The apartment complexes lining La Grange Road now are a stark contrast to Hodge's 100-year-old home and the bungalows just a few blocks away on Wood Road. "This used to be the country," Hodge said. "It's all so different now."